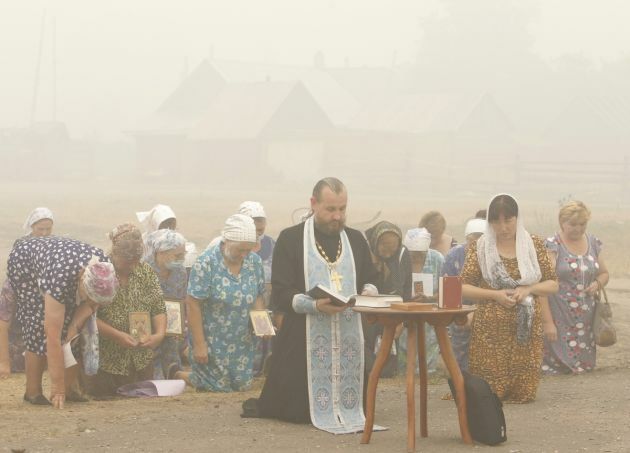 (Photo: REUTERS / Denis Sinyakov)People attend a religious service, asking God for rains to prevent new wildfires, in the village of Kriusha, which is shrouded in heavy smog, some 250 km (155 miles) southeast of Moscow in Ryazan region, August 7, 2010. Forest and peat fires by the highest temperatures ever registered in Russia have killed at least 52 people, made more than 4,000 homeless, diverted many flights and forced Muscovites to wear surgical masks to filter out foul air. Anglican bishops from some of the regions of the world most challenged by climate change such as from Fiji, Argentine, Namibia and Alaska, are to meet in Cape Town to strategise on achieving climate justice. Cape Town Archbishop Thabo Makgoba, chair of the Anglican Communion Environmental Network and Southern African Anglican leader, is assembling a group of bishops from countries impacted by climate change. Rev. Rachel Mash, the environmental coordinator for the Anglican Church of Southern Africa said that 16 bishops will gather in Cape Town from Feb. 23 to exchange ideas and concerns, to share challenges and successes. "Bishops have been chosen from countries reflecting the great challenges we face, from the sea level rise of Fiji, the deforestation of Argentina, the droughts of Namibia, the tsunamis of the Philippines and the storms of New York, and the warming of Alaska," said Mash. "These bishops are united in their commitment to addressing these environmental challenges." First the bishops will hear about the challenges faced in different parts of the globe, said Nash. "Then they will share actions and theologies that have been helpful in moving forward. "The goal is to strategize together in order strategies for raising the issue of climate change and environmental degradation throughout the global Anglican Church." The bishops and archbishops identified are already active in responding to climate change and environmental degradation as a result of human activity in various ways. "The bishops will share their experience in responding to climate change so far, their hopes, their concerns, and ideas about how they, specifically, might organize themselves better for that purpose," said Rev. Mash. "They will have an opportunity to reflect and study together, and to look at the obstacles they face and discern what they can do, by working together, to move through these obstacles." Drawing on their experience and ideas, a strategic plan they will develop proposals for broader engagement in the 88-million strong Anglican Communion. Jane Alexander, Edmonton, Alberta, Canada; Mark MacDonald, National Indigenous Bishop, Canada; Andrew Dietsche, New York, The Episcopal Church; Nick Drayson, Northern Argentina; Nicholas Holtam, Salisbury, Church of England; David Chillingworth, St Andrews, Dunkeld and Dunblane, Scottish Episcopal Church; Chad Gandiya, Harare, Central Africa; William Mchombo, Eastern Zambia, Central Africa; Ellinah Wamukoya, Swaziland, Southern Africa; Stephen Moreo, Johannesburg, Southern Africa; Nathaniel Nakwatumbah, Namibia, Southern Africa; Thabo Makgoba, Cape Town, Church of Southern Africa; Thomas Oommen, Madhya Kerala, Church of South India; Andrew Chan, Hong Kong; Jonathan Casimina, Davao, Philippines; Tom Wilmot, Perth, Australia; and Apimeleki Qiliho, Fiji, Aotearoa-New Zealand.